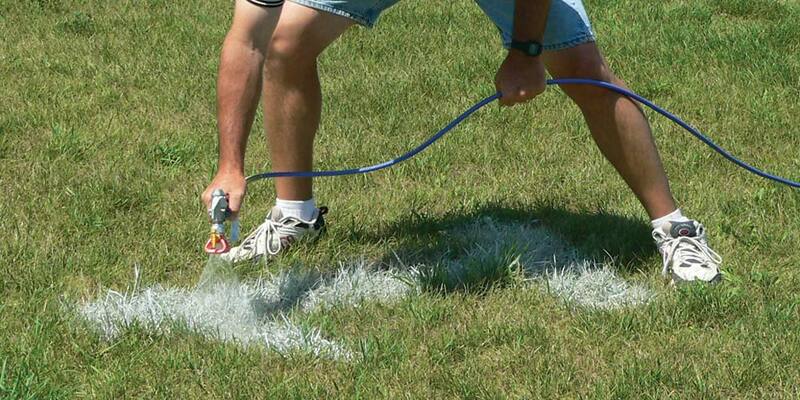 Fall sports are just around the corner, that means football and soccer fields will soon be active. This is the time of year that we see a lot of closet artists, both professional and volunteer, emerge to paint the thousands of fields across the U.S. over and over again during the 3-4 month season. While the professionals are usually up to speed on all of the options available to make life easier when painting, youth organizations and part-time or volunteer painters may not know what may make life easier for their level of paint jobs. 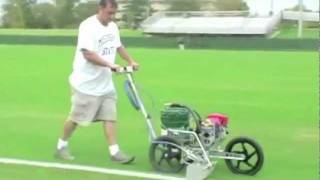 For those that rely on volunteers to paint fields, mobility and simplicity is of utmost importance. Often times they may be doing multiple fields in multiple locations and they may need to haul equipment and paint in their personal vehicle. The best solution here is to use aerosol field paint. 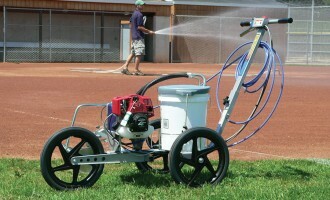 It’s easy, no mixing or diluting of paint, no clean-up, and it travels easily. 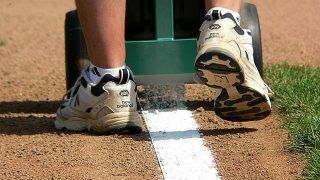 The lines they produce, while not NFL quality in sharpness or brightness, are respectable enough for youth sports. 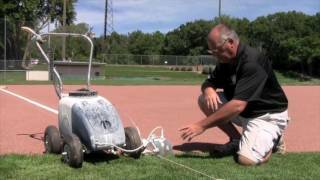 If you are responsible for painting a field or fields at one location, your choices open up as you can move to the bulk paints and the larger gas or battery powered painting machines. 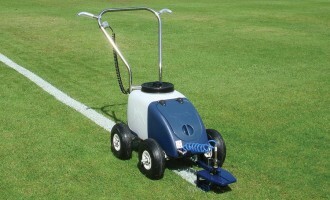 These paint machines will apply a sharper line and depending on the paint, a brighter line as well. 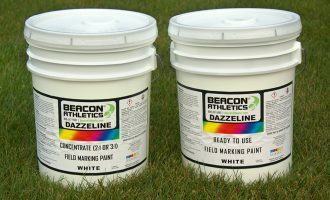 There are “Ready-to-Use” field paints, like Beacon’s “Dazzleline RTU” paint which is already diluted paint. This removes the messy job of mixing and diluting so that all you have to do is pop the lid, give it a stir and put it in your paint machine to spray out. These “RTU” paints are again a great help to volunteers as it takes the guesswork out of getting the paint consistency right. 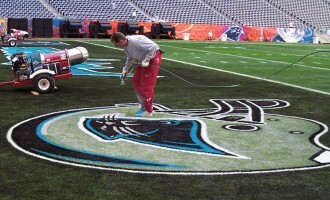 Just spray the paint and then clean the sprayer with water when finished. If you choose not to use the “RTU” paint and use the concentrates, then it will involve lots of mixing and certainly more labor time to do the job. For professionals, they are used to that and will likely have a streamlined system to help move the process along. For volunteers or people who only paint on an occasional basis, this process could be daunting. Be sure to read carefully on the field paint labels as to how far you can dilute that particular paint as it differs from on concentrated paint to the next. 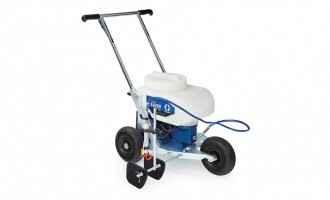 The type of pain machine you use for spraying bulk paints also will dictate how easy the job is. 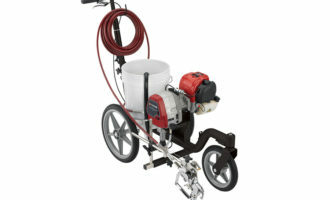 Most paint machines on the market now give you the ability to place a 5-gal pail right on the machine and insert a siphon tube into the bucket of paint. The paint is siphoned out and when finished, cleanup is as easy as placing a bucket of water on the machine and placing the siphon tube in it to flush all of the lines in the machine. If you used a machine with a hopper that you poured the paint into, then cleanup will be much more involved and time consuming. If you are confused with what paint or paint striping unit makes sense for your situation this fall, give us a call (800-747-5985) we can walk you through what will be the best situation for you and your organization based on your budget, your level of applicator experience and the final visual results you are hoping for. 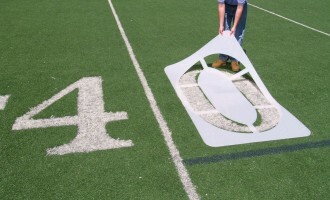 Our customer service reps can also help you with any templates you may need in order to properly mark the playing surface or for painting logos on the field.